The market leading provider of guest centric software for the hospitality industry, with an installed base of over 160,000 hotel rooms across Europe, the Middle East, Africa and Asia. Otrum is changing the game in the hospitality industry. In 2017 Otrum executed a major financial turnaround delivering a fantastic growth of 22,000 new in-room software licences and an all-time high growth in Otrum signage licences, all of this with an 8-year record high EBITDA. 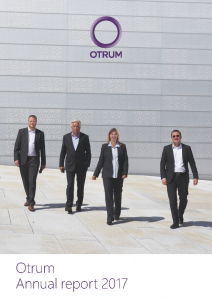 Otrum’s CEO, Stein Surlien is the majority shareholder in the company – with the remaining shares being held by members of Otrum’s management team. Otrum operates with a network of strategic partners throughout Europe, the Middle East, Africa and Asia. We are continually expanding our Partner Program to include new geographical regions and welcome enquires for all areas. For over 30 years, Otrum has created innovative guest centric software for the hospitality world. Branching out into new verticals, we offer powerful signage and TV solutions for all industries where hosted applications utilising onsite smart displays have become reality. In addition to hospitality, Otrum is actively present in the healthcare, leisure, retail and commercial sectors. Otrum’s software solutions are used by all major hotel chains, as well as signature independent hotels. Many of Otrum’s clients take advantage of Chromecast and Apple TV streaming solutions, in addition to leveraging our content licensing agreements to provide guests with premium content such as movies, TV channels and real-time information feeds (e.g. flight status and live weather). Professional technical services are a cornerstone of Otrum’s highly regarded reputation, from physical onsite surveys through to remote online monitoring. All Otrum software is cloud based and is remotely monitored 24/7/365, in the unlikely event of a problem we know about it before you. With comprehensive Service Level Agreements (SLA) our Partners deliver a consistent experience throughout all areas of operation.